The Loyalty Rewards Consultant Dashboard allows Consultants to quickly manage their customers purchases remotely if they shop Online for example. Easy to search for a customer and virtually punch their Loyalty Rewards Card, You can also see how many punches they have, add punches, or take one away for a return. See if they have earned a free gift, what gift they earned and redeeming the gift, you can clear it as redeemed. Visually see when their birthday is coming up, set them up as a VIP Customer and change contact details. As it’s web based it’s always available from any internet connected device like a phone, tablet or computer. 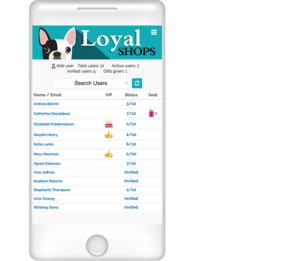 Loyalty Rewards Consultant Dashboard – Keeps you up to date with your customers purchases, birthdays and contact information.